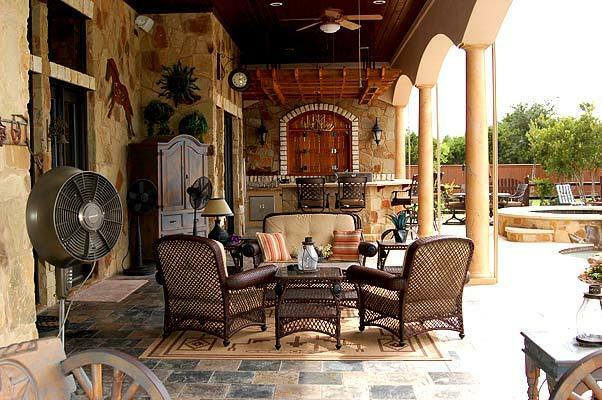 Archadeck of Austin has been serving the central Texas and Hill Country area since 1999, building the finest patio designs and hardscapes on the market. Patios have certainly changed over the last 5 – 10 years. Not too many years ago, most patios were made of simple concrete or brick pavers. Today’s patios encompass a wide variety of natural stone, pavers and synthetic stone and are often assembled with unique footprints complementing the architectural elements present on your home, and the surrounding landscape. 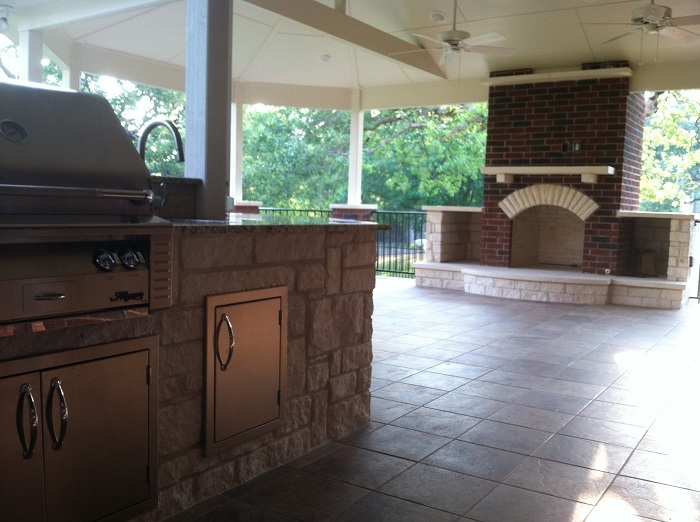 Our patios include vertical hardscapes with outdoor kitchens, outdoor fireplaces and fire pits, retaining walls, decorative pillars, and even hardscape stairs and steps. 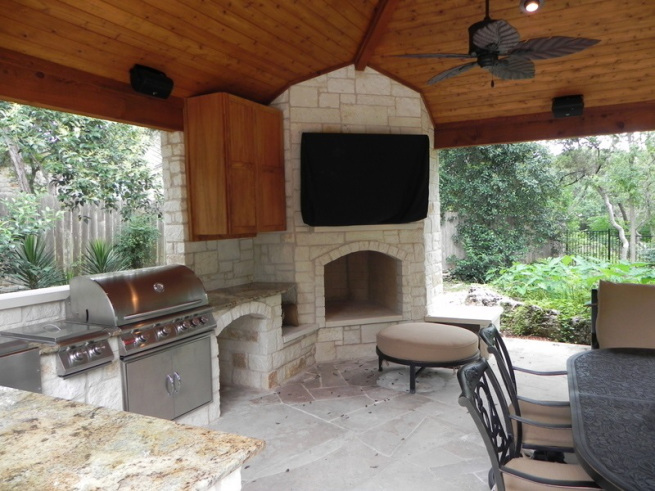 Archadeck of Austin has tremendous experience and expertise in designing and building Austin’s best patios and hardscapes. There are so many materials available for your patio that it can be overwhelming to nail down your selection. Not only are today’s pavers beyond basis brick colors and rectangular shapes, the stone options are seemingly endless. But if you’re not sure if you’d like pavers or stone, you might want to consider whether you’re looking for a consistent and organized pattern that’s very pleasing to the oganized mind and logical eye, or something more random and creative that’s more pleasing to the rustic or artistic eye. Pavers are now made in just about any earth-toned hue you can imagine. They also come in many sizes and with a multitude of textures. Lean on Archadeck of Austin to help you decide. We can guide you through the color family and to the shape/size and finally the layout decision for your particular project. There are also other options such as stained and stamped (scored) concrete or outdoor tile. Both of which come in a variety of colors and subtle textures. When choosing a hardscape for your Austin outdoor structure stone is a natural! Natural stone comes in a myriad of colors, textures and variances in undulation, or waves and bends present in natural stone. Natural stone is derived from a multitude of locations within our earth, and with any material that is derived from nature and the earth, no two pieces of stone are exactly alike. The differences and variations present in natural stone only add to its charm and are part of what makes it so popular among the many materials available to create a truly unique hardscape outdoor structure. 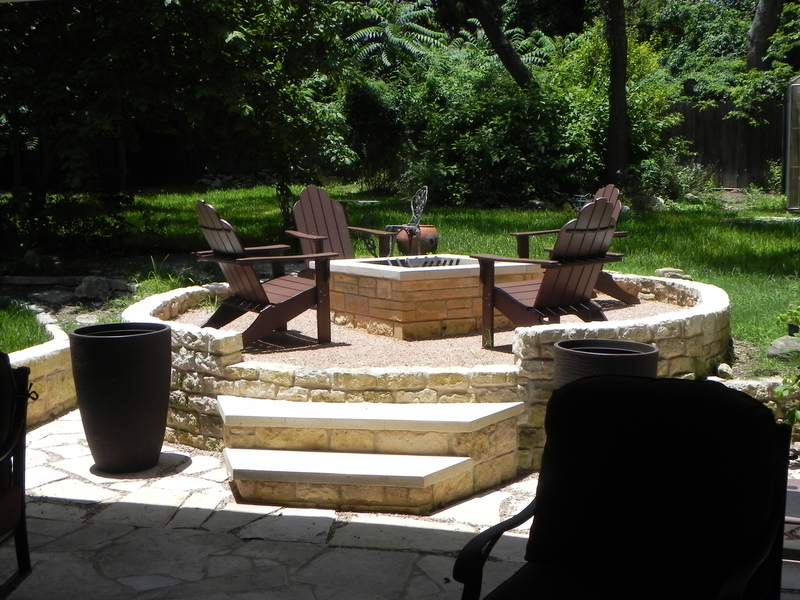 Contact Archadeck of Austin to learn more about creating a breathtaking hardscape outdoor masterpiece for yourself. You can reach us at (515) 259-8282 or via email at [email protected]. Our signature item is the flagstone patio. 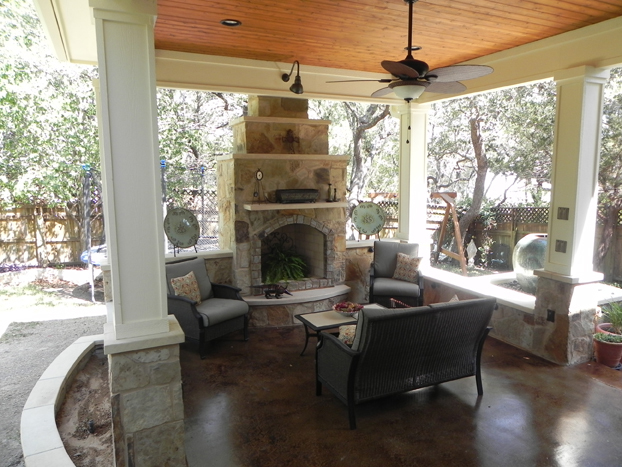 Whether it is built in unison with a deck, pergola or another one of the custom outdoor structures we build for homeowners here in the Austin area, the added essence of flagstone makes the entire project breathtaking. Austin is hill country which yields varying grades and steep drop offs which often include natural stone, but natural stone used as a building material is common because of its natural beauty and the way it complements the natural surroundings and backdrops of your property. Flagstone is quarried from the ground and therefore will not yield a completely even surface. Flagstone patios are set on either concrete or mortar beds. Our flagstone patios our sealed with a “matte” finish penetrating sealer which are not visible to the naked eye that they are being absorbed. This sealer will last from 6-12 months. After the initial sealing, the patio may be resealed again at your discretion. 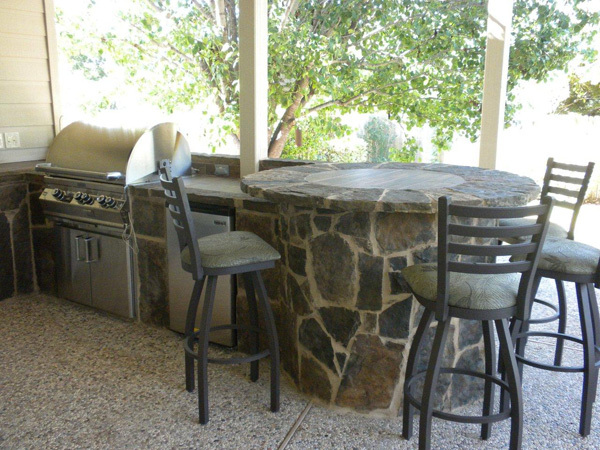 If you are placing a BBQ pit or grill atop your flagstone patio be careful not to let grease or drippings on the surface of the flagstone as they can stain the stone and become permanent. Running only second to flagstones popularity here in the Austin area is Leuders stone, also known as limestone. Limestone is formed when sea beds dry up in layers over time resulting in the decay of aquatic organisms. This sedimentation process over time and intense pressure yields limestone. Limestone is basically calcium carbonate which is a pure form of a very soft alkali. Not unlike the other natural stones we have listed, limestone can also be stained or damaged by outside forces. When exposed to acidic properties which are present in wines, sodas, coffees and other beverages it can result in a condition referred to as an “etch mark” which needs to be polished to be removed. Repeated acid or high moisture attack can result in permanent and irreversible stone damage and color change. This stone class can scratch easily under normal wear. 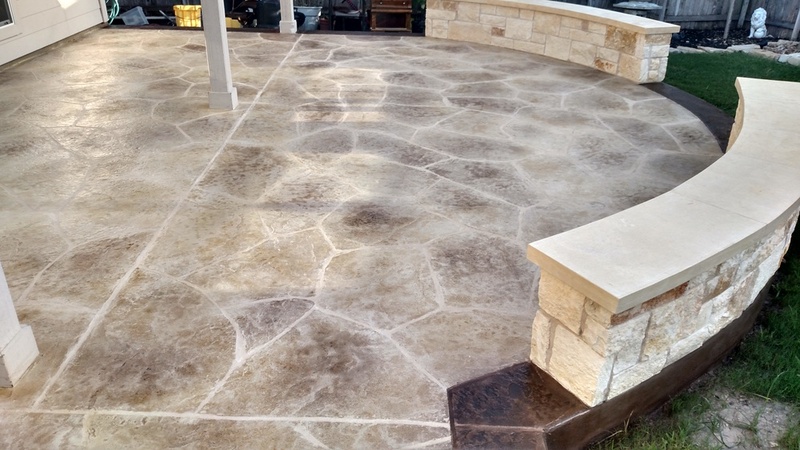 Despite the fragile nature limestone has under certain circumstances, it is one of the most beautiful stones we use and as long as it is properly sealed and taken care of can prove to provide years of beauty and outdoor enjoyment. 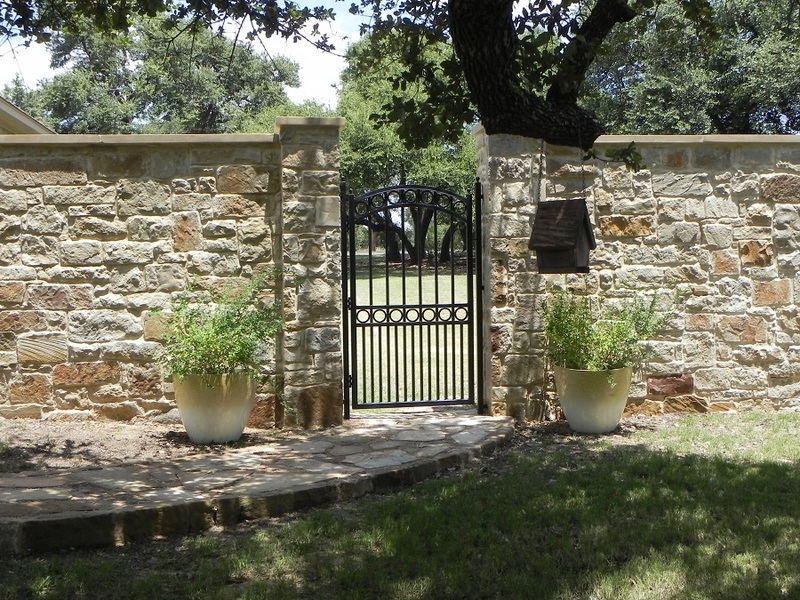 Flagstone is not the only natural stone that is coveted among Austin homeowners for its beauty and unique characteristics. We also use sandstone and slate in many of our projects. Sandstone is created when sand and an alkaline settling is formed under pressure and joined at the uppermost surface of the earth. Slate, as well, is a rich, deeply undulated natural stone that is popular in building outdoor hardscape structures. Slate and sandstone are very similar in the manner formation of the stone itself occurs. Slate is formed when wide ranges of minerals are compressed in layers near the earth’s’ surface over time. Slate is however prone to what is called “cleft plane spalling” which is a process where layers separate from the main stone body. Combined with the soft character of slate, these layers can be separated by walking on the surface, dropping or moving items over the surface or an excessive presence of moisture. Due to its’ soft nature, slate is also prone to scratching. All of these types of stone are excellent choices for masonry projects. They can all be sealed to help prevent staining. These stone makeups are available in a chopped block, patio stone or capstone. Combining various styles can add more texture, dimension and depth to your project. All are extremely durable and will outlast us all as we know since they have already existed for thousands of years. Within these stone types, there is a wide variation of colors and hues. So when choosing the hardscape material for your patio or other outdoor living structure, natural stone is a natural indeed!